A good lunch game is hard to find. A game that easily lands itself within an hour time frame often lacks the depth of longer, more satisfying gaming experiences, and games that go beyond the bounds of a lunch hour might force some players to sit out or work after hours to make up the time. Enter Santiago de Cuba, a lunchtime Euro of black-market goods, supply and demand, and shipping. But the question is, is this a boat you want to be on? Find out below! 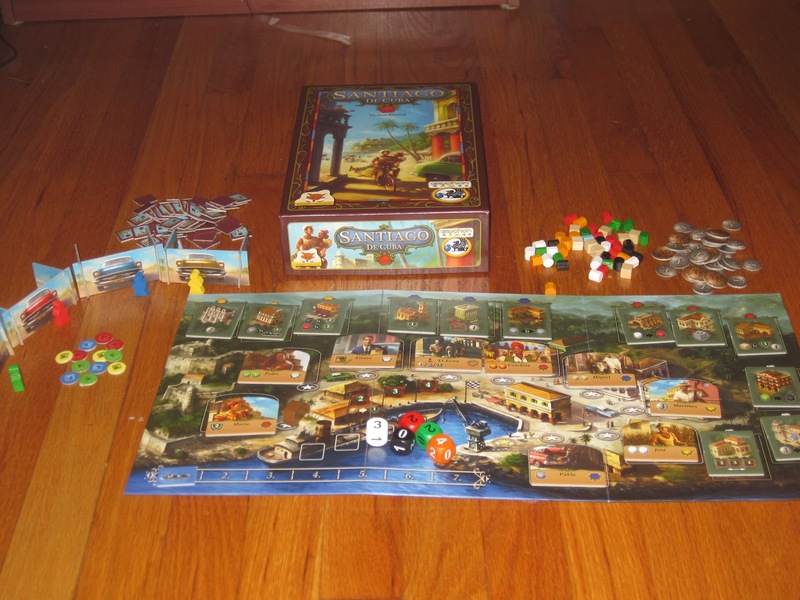 Santiago de Cuba is a Euro game of shady wheeling and dealing for 2-4 players. The goal of Santiago de Cuba is to score the most points by efficiently collecting and then selling a variety of goods—citrus fruit, tobacco, sugar, rum, cigars, and wood. Players begin the game with a small number of goods as well as a (very small) player shield and player marker. Each turn is taken in two steps: travel by car to a Cuban or to the port; use a building. The first phase involves moving a shared car—one space forward automatically, and paying for any additional movement—around a circular track. At each stop, a Cuban citizen offers goods, pesos, or a special ability such as stealing items from other players or seizing ownership of a building. In the second phase, the player must then move their character to a building (the choice limited by the Cuban’s matching rose color), which provides an optional ability, such as converting one type of good into another, preemptively selling goods for money or points, or increasing the potential value of goods at selling time. One of the car stops is a port, which has no citizen attached to it. Instead, stopping at the port activates a selling round, in which players may sell goods, one type at a time, to the ship in port. Each good receives the same amount of points, but the actual amount can be increased by a building power or just by passing up the port without stopping to sell goods. The catch with selling goods is that demand is limited. There are five standard goods, and five “demand” dice to match, with sides ranging from 0 to 4, but there are only 4 slots for dice available on each ship. The dice are rolled and selected when each new ship arrives; the ship leaves when all the demand is met for all the goods. The other catch is that players may collect wood, a sort of wild good that is worth fewer points but can reduce the demand for any good at the port. The game ends when seven ships have met their demand. The player with the most victory points wins. Santiago de Cuba might be the shining example of a lunchtime Euro: typical Euro feel (goods, cubes, conversions, and victory points), small box, simple rules, and fits easily within a lunch hour. It also feels thematically meaningless and at times a little soulless. Of course, depending on your tastes, this game’s being a lunchtime Euro may be a good thing or a bad thing. Demand dice hard at work. Looks like @Futurewolfie won’t be trading his tobacco like he’d hoped. One thing I love about this game is the demand dice. The demand dice limit what players might want to collect and so redirects their efforts toward pursuing the goods in demand. This creates competition where there might not be much elsewhere. In fact, the demand dice can get downright nasty. Since only a certain number of each good are available to load on each ship, players must be careful to not over- or under-collect goods. Increasing the tension is the wood cubes. Since wood can be traded in at a lower value to lower the demand of any die, players must be on their toes. Procuring wood is mostly a defensive measure, but it can really hurt your opponents if you eliminate the demand for their cash-cow good. So, with all this trying to fulfill demand and getting in the way of the other players, how can players plan ahead? There are lots of options—via the buildings—that allow players to convert one kind of good to another. There are options that allow players to sell goods to the ship when not at the port. The cafe always has demand for rum and cigars. And Alonso, the lawyer Cuban, allows a player to “seize” one building, gaining that player 1 point every time another player uses it. (Seizing a good building early on can be a huge boon to a player’s strategy.) The wheeling-dealing aspect of this game is part of its charm. Players must think on their feet to find the best way to get and ditch their goods. Multiplayer solitaire this game is not. This is my typical view of a player screen. While I can’t see everything I placed behind there, it’s still not much of a screen. I just said that there was a wheeling-dealing aspect to this game, and there is. The marketing copy on the back of the box makes it seem like this is a large part of the game, and that this element is highly thematic. Unfortunately, Santiago de Cuba falls flat in the theme department, which is standard for a Euro, really. The game feels like an exercise in conversions (think Milo’s eggs in Catch 22) without conveying the theme of shady black markets. This is fine, but players should not go into this game thinking that it is rich in theme. The artwork is evocative, if not particularly exciting, but nothing in the game feels like the description on the back of the box. 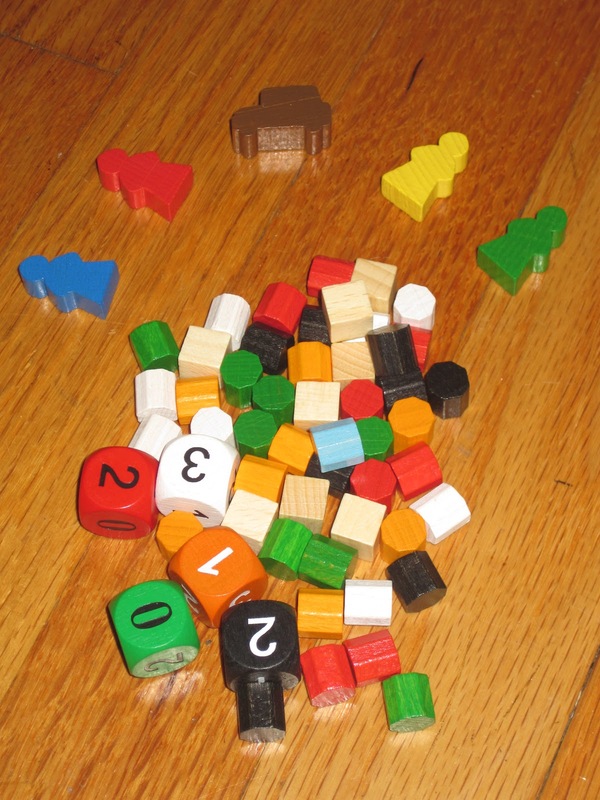 The components of the game are standard Euro fare (cubes! cylinders! cardboard chits!). The game comes in a small box, which is great for carting it to and from work or for leaving on your shelf next to your copy of The Chicago Manual of Style (it’s about the same size as that, for all my editing friends). The thing I am most disappointed with components-wise is the player screens. Everything in the game is intended to remain hidden–point totals, which goods each player has, and bank roll. I think this is great. Unfortunately, I didn’t mention this earlier because the player screens are so small that it’s easy to see around them. Maybe it’s just because I’m tall, but even when I’m not trying, I can see at least which goods each person at the table has. The rulebook says that Santiago de Cuba is the younger brother of a larger game, Cuba. While I’ve not played Cuba, Santiago de Cuba feels to me like the younger brother of a different larger game, Puerto Rico. If you could distill Puerto Rico down to plantations and shipping, that’s Santiago de Cuba. 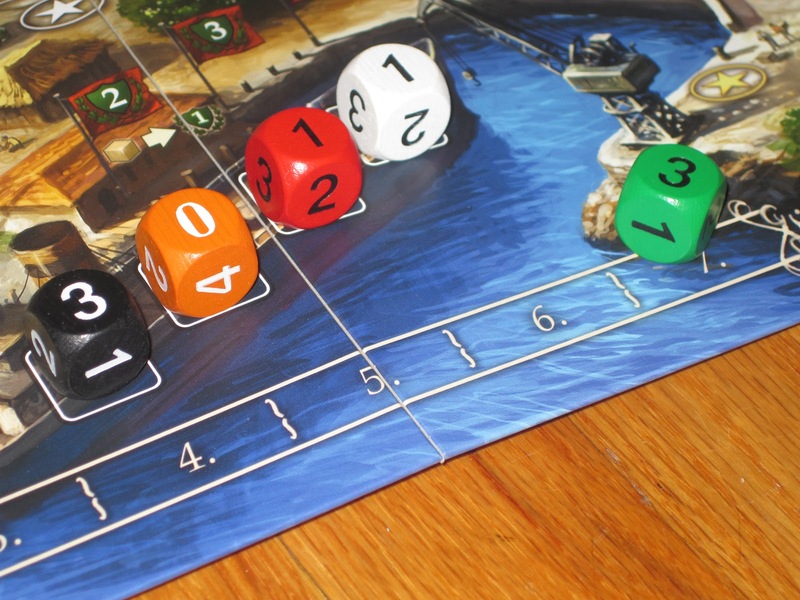 The demand dice, similar to the ship sizes in Puerto Rico, limit which goods and which quantities can ship, and players are carefully trying to maneuver to stick their opponents with worthless goods that no one wants. Santiago de Cuba feels like Puerto Rico Lite, in the same way that Midgard feels like El Grande Lite. But while Midgard has enough thematic elements behind it to stand on its own, Santiago de Cuba feels just as dry as Puerto Rico—which heightens the comparison and makes me, at any rate, just wish I were playing the longer, meatier, and more satisfying Puerto Rico. That’s not to say that Santiago de Cuba is bad or doesn’t have its own charms. It has some excellent elements to it (seriously: the demand dice concept is gold) and is highly interactive for a Euro, especially one that has such a short play time. But even though its length and simplicity are appealing and there are interesting decisions to be made, there are other lunchtime games I’d rather play. And if it’s not lunchtime, I’d probably rather play Puerto Rico. 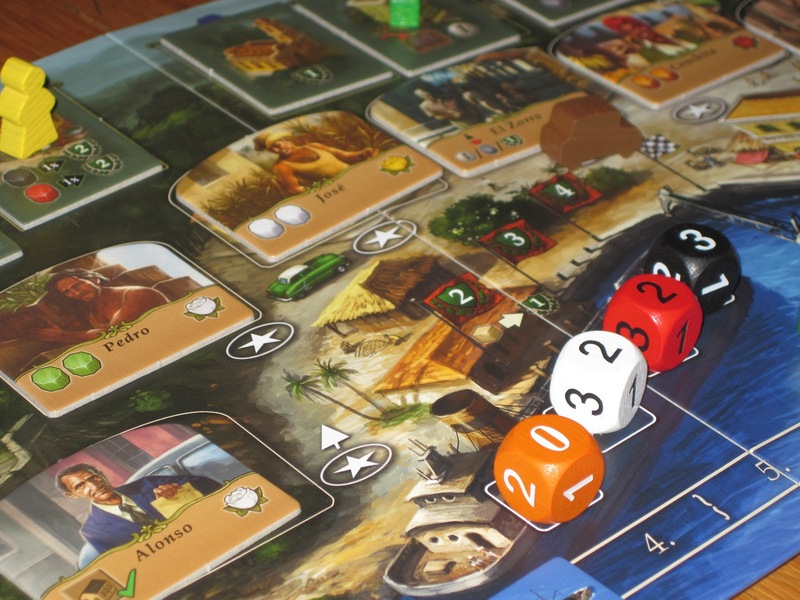 Santiago de Cuba is another in a long line of Euro games that follows the “buildings with special powers, collect resources, sell resources for points” format. In this case, however, you’re not responsible for building any buildings or hiring new workers. In fact, the powers available generally don’t change; you’ll have the same abilities at the end of the game that you had at the start. It’s a pretty simplified system (although mastering the best way to score points is a little tougher). Everyone has access to everything, with the shared car system allowing you to ‘block’ other players by moving just past the citizen they need or using a building so no one else can. But it all results in the same basic shtick as many other eurogames: how can you efficiently collect resources, and then efficiently sell them, without giving your opponents opportunity to do the same? Each Cuban has a rose that corresponds to a set of buildings. The buildings assigned to each rose change from game to game, opening new strategic possibilities and adding some replayability to the game. The most interesting part of the game comes with the demand element. The use of dice is effective, without screwing over anyone by randomness; but the real interest comes from the ability to modify this demand. When the car stops at port, it’s a race to sell the most goods; if you can block other players by selling the same type of goods they possess before they get a chance, flattening demand and removing their chance for points, that’s all well and good. But building powers can get you some preemptive strikes; there’s a building that lets you turn any single demand die to 0, and a building that lets you sell to the ship before you reach port. Using those right may not maximize your point intake, but it can absolutely destroy the other players’ abilities to sell. On top of that, playing with wood can also help you screw demand; you only get 1 point per wood you sell, but you can take away demand for any good. Which is a great way to mess with your opponents. It’s also important to think about demand on the next ship. If you can get the chance, it’s a very powerful position indeed to be the one rolling and choosing the dice. You can exclude a popular good that you don’t have, or choose the lowest numbers to keep everyone fighting over limited supply. However the rule for which player got to roll was a bit confusing. 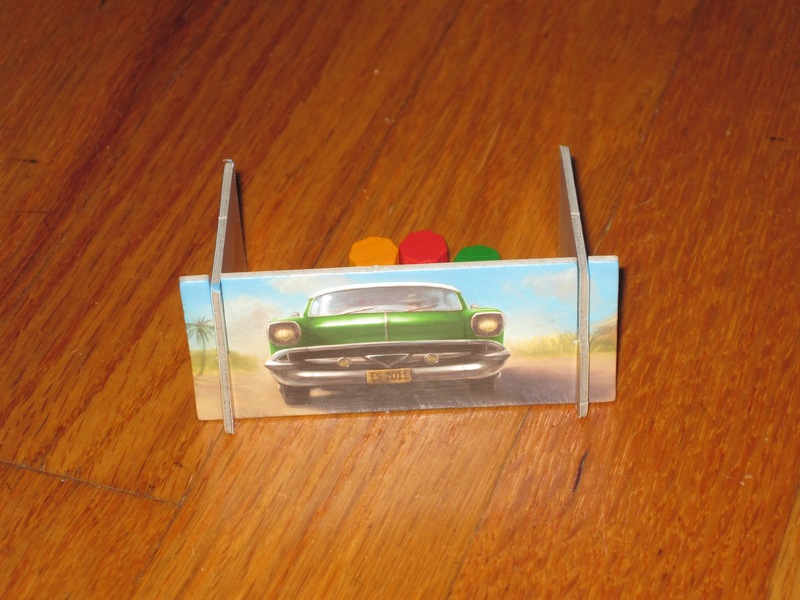 In my original interpretation, I thought it was whoever satisfied the last bit of demand – whether by using a building to knock the last die to 0, using a building to sell a good down to 0, or being the player who sells the last good to meet demand when the car is stopped at the pier – but in fact, the player who drove the car to the pier gets to roll the dice in the last case. It makes a difference. 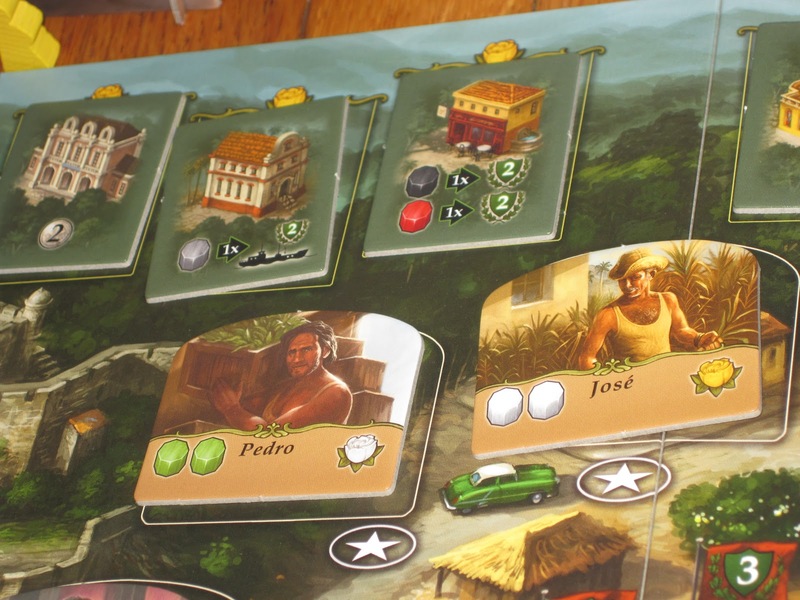 Overall, Santiago de Cuba is mechanically simple, with enough depth that you can’t master the scoring immediately. The randomization of the buildings and citizens keeps it from being a solvable puzzle, but it doesn’t shake up the gameplay at all (especially since there are no extra buildings or citizens; each one gets used every game, it’s just a matter of their position.) The game is short enough to fit in a lunch hour, which is nice, and the demand mechanics are clever. It’s a solid game—nothing is broken (as far as I can tell), but it isn’t all that captivating to me. I can enjoy it, and the demand system separates it slightly from other similar games, but the theme is meaningless and there’s nothing extremely unique about the overall gameplay, so it lands solidly in the “meh” camp for me. iSlaytheDragon would like to thank Gryphon Games for providing a copy of Santiago de Cuba for review.